The little known brain cells that can explain ADHD (you have never heard of them anywhere else – in fact, your doctor probably never has heard of them!). 5 reasons why medication are not the real long-term solution. 10 key questions that will pinpoint to the causes of ADHD. Lab test your doctor may not know about that will help understand the underlying cause of the problem. When, how and who to select to create a health care team that will assist you on the road to overcoming ADHD. A revolutionary new approach that helps erase the stress of ADHD while boosting concentration. The two worst food for children with ADHD (for some children, they are the true causes of ADHD). Brain-healing nutrients for the ADHD brain. Tools to discover and embrace the gift in ADHD. 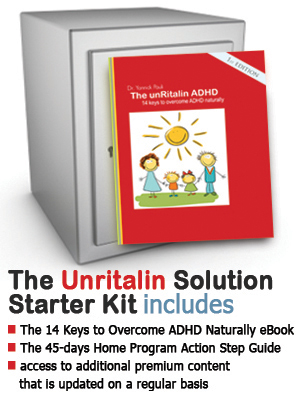 45 days Home Program that will get you started on the road to overcoming ADHD.